When I was a little boy I used to imitate the sporting heroes from the telly. Whether it was football, tennis, running, whatever. I was easily steered by things I witnessed. Easily led, my mother used to say. Although I was just as easily led in the unhealthy direction also. I’ll bet all over England today there are both kids and adults with a new sense of hope in their personal running and jogging ambitions. I am not making this statement lightly; Yesterday evening I witnessed one of the greatest feats of mental strength that I have seen. The reason I have waited 24 hours to post my excitement is that I was hoping for some video evidence to emerge on youtube, to back these words up. I am talking about a 5000 metre race in Glasgow, as part of the Commonwealth games. What occurred during those fifteen minutes will go down, in my opinion, as a perfect example of what happens when a little belief and a lot of encouragement, come together to turn a crazy, crazy dream into reality. Picture yourself as a forty year old, mother of two, in a race against girls half your age. Some of whom hail from Kenya, the greatest distance running nation on earth. I greatly admire the Kenyan athletes. They have to work extra hard to make their country’s team. The standard is so high that picking any name from a hat of hundreds could prove to be a possible gold medal Olympian. That is no exaggeration. They are that good. I can feel my heart rate rise even as I think about it now. The 5000m race is twelve-n-a-half laps of the track. The seventeen females ran as a group until lap number six when the three Kenyan ladies made their move. It was like they said “Okay, that was a warm up. Let’s show them who’s boss.” Except they spoke with their legs. Only two non-Kenyans were brave enough to chase them; Jo Pavey of England and an athlete from Australia. With 600 metres to go the three Kenyans and the Australian steamed past Pavey. 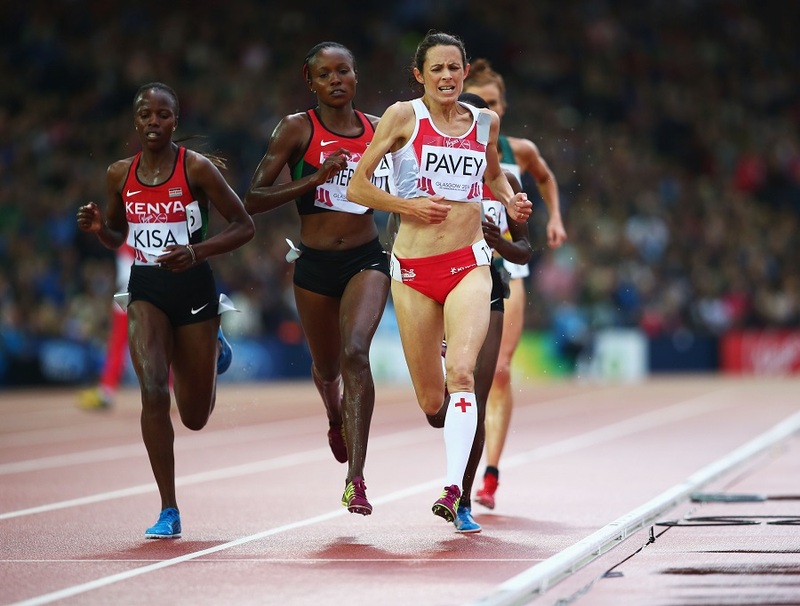 I thought, even the commentators thought, that was the end of Jo Pavey’s gutsy run. But to everybody’s amazement, especially the crowded stadium, the English woman overtook them all again as the bell rang for the final lap. The pace was mental fast now. The three Kenyans collectively decided to put an end to her ambition. They kicked into sprint mode down the back straight with 200 metres to go. Pavey was gasping for air by now. The African train steamed past. It would have destroyed any other runner. But something happened, just when all hope was lost the crowd cheered even louder, the forty year old clenched her teeth to fight the exhaustion. Her face grimaced in pain, she was gasping for air, but she pumped her elbows with all her might and made one of the greatest comebacks I have ever witnessed. In a sprint finish she managed a bronze medal. In fact she almost took silver. It was quite possibly one of the greatest races, start to finish, there has ever been. She has given hope to all athletes with her mind over matter attitude. She proved that the Kenyans, greatest running nation ever, are only flesh and blood like the rest of us. It’s a pity there isn’t yet a video on youtube. I suppose these things take time. But I will bet, when it appears, there will be coaches all over England, perhaps all over the globe, using it to show what “giving your best” actually looks like. Well done Jo, credit where it’s due. I’m off to break the world record, just like that impressionable little Irish boy back in the day. This entry was tagged hope, if, inspiration, Running, trucker, writing. Bookmark the permalink. haha, I WISH! I guess we should never say never, though. Wow, I gotta go rest now. My heart is pumping. Have you thought of giving up trucking for sports commentating Frankie? GoJo is right! And good luck my friend. Over to you Bob! …I mean Cheryl. I didn’t see the race and while I don’t have to after your commentary, I will look for this on YouTube. I am not a distance runner, but I do admire the strength and courage it takes. Great post. Thanks Ger. There was also a very brave performance by a Canadian in the mens 10,000m. I won’t spoil the ending but it is also well worth a watch when it comes online. Don’t you savor moments like that! If I’m moved enough by an event, which in many cases last only moments, I may watch it over and over and over, just to keep feeling the excitement. 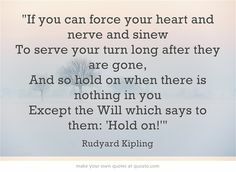 The Rudyard Kipling quote is a perfect accompaniment to your article. Nice work on that, too! It’s a pity you can’t bottle “Cathy comments”. They would cure any ailment.